This paper gives an overview to modern technologies in GPS/INS for direct geo referencing from the application point of view. It also describes the integration of these new technologies into mapping market and for other use of surveyors. Empirical results from more than 30 projects are discussed. In the field of photogrammetry and remote sensing airborne sensors are more and more applicable. This can be seen directly in relation to the establishment of Geographical Information Systems (GIS) in most of the geospatial applications. The users are requiring fast, inexpensive and actual information. The most common airborne sensors nowadays are still the optical systems (passive) like film cameras. But also the different sensors for multispectral applications. Additionally active sensors like the airborne laser systems (LiDAR = Light Detection And Ranging) or InSAR (Interferometric Synthetic Aperture Radar) are more and more important. Especially LiDAR mapping is a fully accepted technology to generate high accurate digital terrain models (DTM). For all these sensors it is necessary to know their 3-dimensional orientation during the time of detection of the information. This is known in photogrammetry as the determination of the exterior orientation parameters and is a standard procedure called aerial triangulation in the photogrammetric workflow. Since in the seventies additional sensors like the statoscope  and later on the application of differential GPS were introduced to measure the elements of the sensor orientation in a direct way. The aim was always to reduce the necessary number of ground control points . Only in the last few years the direct measurement of all parameters of the exterior orientation (so called direct geo-referencing) by a combination of GPS and INertial System (INS) or Inertial Measurement Unit (IMU) was successful and could be offered at a reasonable price to the users. In the following some of the typical sensor systems in practical use should be introduced. The latest results of several projects and sensor types will be presented and the experiences out of the projects from the point of view of a service company will be described. The most common sensor in the field of surveying and mapping is still the traditional aerial film camera. It is assumed that there are about 1,000 systems worldwide available whereof about 500 cameras are in daily use (see figure 1). The typical applications are the exposures of black and white, color and color infrared images, which are used for photogrammetric mapping and interpretation. The aim of the integration of IMU’s is to reduce or avoid ground control points and the production step of aerial triangulation. The latest developments are to replace the film cameras by optical digital sensors of similar ground coverage. All of them offer or respectively need the INS for their orientation. A “small format” version can be seen in figure 2; this system has an integrated INS of APPLANIX. Some test flights and the first commercial project showed very reasonable results for special applications (see chapter 4). Besides the optical sensors for mapping applications like photogrammetric stereo plotting or digital orthophotos the LiDAR systems are since their strong development during the last 12 years in daily operations. These systems can only be directly geo-referenced and need therefore the GPS/INS system which is an integrated part of it. An example can be seen in figure 3. Among all the different multispectral systems the thermal scanning (see figure 4) devices are used quite often for the observation and control of temperatures of different features on ground like rivers, leakage of heat pipes etc. As the system needs to be referenced to a ground coordinate system also the GPS/INS to get the orientations of the scan lines in an easy and fast way. The method of direct geo-referencing allows to transfer sensor or object data immediately into a local or global coordinate system, which makes their further processing possible (see figure 5). Such a system exists of receivers of the global positioning system (GPS) on board and on the ground (reference stations) and an inertial system combined with a sensor, which determines angles and accelerations of the sensor with high precision (see figure 6). Fig. 6. 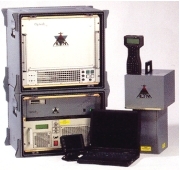 GPS/INS system Aerocontrol (IGI Kreuztal) as an example. There is now some years experience in photogrammetric companies with the method of direct geo-referencing with GPS/INS systems. LiDAR systems were used since more than 10 years very successfully with integrated GPS/INS systems. The GPS receiver and the INS form together with the laser system a compact unit. By the use of several calibration procedures the results of the LiDAR survey have an accuracy of up to 15 centimeters. As an example the company Hansa Luftbild is operating since about three years the modular system Aerocontrol for the combination with several sensors. First results were presented in 2001 . In total more than 30 projects were finished now (besides the LiDAR projects which will be far more than 100). In table 1 the used sensor types are shown. The main focus is on the analog film camera with about 68,000 images taken in combination with the GPS/INS system. Thereof for about 40,000 images the GPS/INS information was used for tests and safety reasons under special terrain conditions. Some of these tests resulted in a long-term study of system calibration (see ). For about 20,000 images the parameters of the exterior orientation were determined and delivered to the clients for their internal use. No information about the quality of these data is available neither their use. Tests were done by the customers themselves. Only about 8,000 images were used in house for further production processing under the control of the quality management system. Table 1. Summary of GPS/INS related projects. All the internal production resulted in the generation of digital orthoimages. The DTM data was delivered by the clients or bought by the regional surveying authorities. 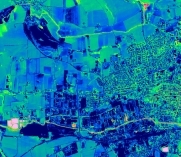 The DTM quality and resolution was chosen in respect to the ground resolution of the orthoimages. The quality of the orthoimages was verified by joining images, digital maps and ground control points. In many cases the existing DTM was not sufficient and had to be corrected or filled up with higher resolution DTM data. So for about 60% of these projects the parameters of the exterior orientation determined out of the IMU data were completely sufficient. For the remaining 40% of the projects additional efforts were necessary. The quality control showed differences which could not be explained by the DTM, standard calibration procedures or similar effects. Therefore these projects were determined by the help of the traditional aerial triangulation. In some cases the overlap of the images was only 30% which is sufficient for direct geo-referencing but not for the aerial triangulation method. The computation of the old procedure called “Anblock” where only the overlapping areas were used for a horizontal triangulation step like in the former model block adjustment brought very reasonable results. This means that some of the defects of the direct geo-referencing were caused by remaining tilts (heading) of the images which could be caused by remaining systematic errors. Of course in a production environment it was impossible to analyze the exact reasons for these defects. The projects with the thermal scanning device in combination with the Aerocontrol system were quite successful. The GSD was 1,5 m, flying height 750 m above ground. An example of the geo-referenced thermal data can be seen in figure 7. The latest experiences this company had with the digital camera system ALTM 4K02 in combination with a LiDAR system. The aim was to produce a digital surface model by LiDAR data and a digital orthoimage out of the camera data. This project showed similar effects as we have seen with the classical film camera. To get reasonable results the system calibration has to be done carefully. The GSD was 0,15 m and the maximum differences at joining images were 0,50 m. The further improvement of the calibration procedure promises even better results. The experiences with the direct geo-referencing are quite interesting. It was found out in the beginning that for the determination of the misalignment a separate calibration field in the vicinity of the airport, where the planes are located, is insufficient to take the systematic errors optimal into consideration. The calibration fields are now located inside the area to be flown and must be flown at the same flying height as the whole project. To get the best accuracy this calibration will be done for each flight day and depending on the total length of the daily mission at the beginning and at the end of it. For safety reasons it is recommended to have a forward overlap of the images of 60% to determine if necessary an aerial triangulation. Besides these points there are some useful regulations during the survey flight itself which have to be taken care of by the flight crew. The long-term stability of the INS has to be taken into account for example when long strips have to be flown. As the direct geo-referencing method is working without any ground control the datum transformation is also quite sensible. All the information of the sensor is referred to WGS84 system. The final results normally are to be delivered in a local coordinate system, which has certain network deficiencies. As the transformation parameters very often are only available for larger areas with a certain approximation identical points in the vicinity of the area to be flown are necessary. The integration of the GPS/INS data into the aerial triangulation is also often discussed. Specially to get better approximation values for the automatic procedures. In practical applications we have seen that the GPS data are completely sufficient as start values for the triangulation process. So an additional use of the INS system is a matter of economics. It has to be analyzed if the number of the ground control points can be reduced further more in comparison with the standard use of differential GPS. But also in this case the decision will be taken by economic aspects, i.e. the costs of ground control points vs. the INS. An overall technical discussion of this topic can be seen in . The direct geo-referencing of the sensor data has from the application point of view still a lack of reliability. Many quality control procedures are necessary. The refinement of the mathematical model by many years of research and empirical tests and the high redundancy and reliability of the indirect method like the aerial triangulation ended in a very comfortable environment for the user and above all in a fully acceptance by our customers. To get the same situation with the direct method some more of independent experiments and qualified prediction procedures are absolutely necessary. The use of GPS/INS for direct geo-referencing of airborne scanning devices is nowadays standard. Without this new technology their application would be nearly impossible. Most of the actual developments of digital optical cameras offering integrated IMU’s. For conventional analog aerial images the procedure of the aerial triangulation is still preferred in the case of stereo plotting. But for the generation of orthoimages the method of direct geo-referencing is coming more and more in practical use. Questions of redundancy respectively reliability, prediction of accuracies and quality control are still open and have to be solved. The procedures for system calibration and determination of the exterior orientation are quite sophisticated and need very skilled engineers. It is out of question that the application of IMU’s are of great advantage in low-contrast areas like lakes, coastal or dessert zones. The final decision of the use of IMU is besides these technical aspects strongly be influenced by the economical aspects and will be taken project wise.